Was the character of Jack Dawson based on a real person? New research into the life of one of the least known but most intriguing of Titanic victims. There is a grave in Halifax - a humdrum, unadorned marker, modest in comparison with many of its fellows, victims all of the RMS Titanic disaster. The stone at Fairview Lawn cemetery in Nova Scotia bears the number 227, the date of the epoch-making disaster, and the terse inscription of a name: "J. Dawson." For years it was just another name, a headstone and a footnote. Until a 1997 cinematic blockbuster that propelled the Titanic catastrophe back to the forefront of public consciousness. J. Dawson didn't matter until James Cameron made the fictitious character of Jack Dawson a vehicle for his ice-struck love story. Leonardo Di Caprio broke more than the heart of his screen sweetheart, the equally fictitious first class passenger Rose DeWitt Bukater (Kate Winslet). You won't find Jack Dawson and Rose DeWitt Bukater on any passenger list, don't forget, Jack only won his ticket at the last moment! They were both fictional characters. But there was a J. Dawson on the Titanic, but his life was very different to the one portrayed on the screen. There was even a Rose travelling in First Class... but Rose Amelie Icard was not a wealthy socialite but a maid to one of the first-class passengers. A modern generation of young females pined for the young vagabond - and allowed their tears to blur their perceptions of reality. Websites like Encyclopedia Titanica were plagued with questions asking whether Jack and Rose were real people. The grave marker suddenly became a focal point for adolescent emotion. The nondescript body fished from the sea by the Mackay-Bennett and buried in Canadian clay on May 8, 1912, was now a "somebody." Floral tributes sprouted in front of the J. Dawson stone. Admirers left photographs of Di Caprio and of themselves, tucked cinema stubs beside the granite, took photographs and clippings of grass, even left hotel keys... Movie director James Cameron has said he had no idea there was a Dawson on shipboard back in April 1912. There are those who don't believe him, choosing to see instead the hint of an eponymous "jackdaw" plucking an attractive name - and subtly creating an extra strand to the myth. So who WAS the real Jack Dawson? 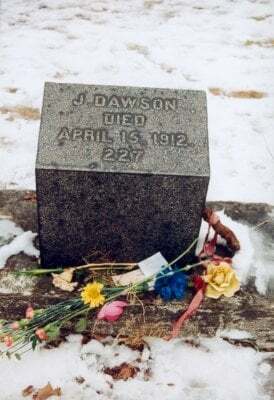 Titanic folklorists long held to the oddly unshakeable belief that J. Dawson was a James, but this is now shown to be just another false assumption. His dungarees and other clothing immediately identified him as a member of the crew when his remains were recovered, and it is ironical that there are indications that Dawson had gone to some length at the time of deepest crisis to assert his right to an identity. Off-duty when the impact occurred, crewman Dawson had time to root through this dunnage bag to equip himself with his National Sailors and Firemen's Union card - before finally being allowed topside with the rest of the black gang when all the boats were gone. It appears the 23-year-old was determined that if the worst should come to the worst, then at least his body might be identified for the sake of far-flung loved ones. And so it proved. Card number 35638 gave the key - the corpse was that of one who signed himself J. Dawson. The name duly appears on the Titanic sign-on lists. J. Dawson was a trimmer, a stokehold slave who channelled coal to the firemen at the furnaces, all the time keeping the black mountains on a level plateau, so that no imbalances were caused to threaten the trim, or even-keel of the ship. The sign-on papers yielded more - that Dawson was a 23-year-old, much younger than the estimated 30 years of age thought by the recovery crew who pulled him from the Atlantic's grasp. His address was given as 70 Briton Street, Southampton, and his hometown listed as Dublin, Ireland. But the man whose body wore no shoes - many firemen pulled off their heavy workboots on the poop deck of the Titanic before the stern inverted, hoping to save themselves by swimming [Thomas Dillon was one of the few who succeeded] - was to leave no footprint in Southampton. Later researchers would wander up a dead end, for there was no number 70 at Briton Street in those days. The numbers did not go up that far, and the trail was cold. A little over a mile from my house in Dublin there is a nursing home, where the oldest surviving member of the Dawson family lives out a feisty twilight at the age of 88, surrounded by crosswords and puzzle books. May Dawson was born in that year of 1912. She remembers tales of Joseph Dawson, the family member who went to sea aboard the greatest vessel of her time. The trimmer who signed with a modest and economical first initial, instead of the Christian name that pointed to a Catholic upbringing, identified with a plain "J", just as he had been when voyaging on the RMS Majestic, his first ship before Titanic. How Joseph Dawson, a trained carpenter whose toolbox survived in the family for many years, left his home city and found a berth on the ship billed the "Queen of the Seas" is a story in some ways more fascinating than even that woven around his invented namesake, Jack Dawson. The similarities between fact and fiction are striking, however - both were young men, both largely penniless, who "gambled" their way aboard Titanic. One a serf to coal, the other a character who wielded charcoal to woo; and both were intimately bound up with beautiful sweethearts. Yet the Joseph Dawson story has more with which to amaze and enthral than that of the Di Caprio portrayal. There is more to it, indeed, than can be told in an hour-long documentary tailored for a TV mass market. Charlie Haas, Brian Ticehurst, Alan Ruffman and your essayist herewith all contribute interviews to the programme, "The Real Jack Dawson", made by BBC Manchester, which will air after Christmas. While others touch on varying aspects of the disaster and the vessel as it affected a lowly trimmer, I hope here to tell the extraordinary personal story that shaped Joseph Dawson. He was a child born in a red-light area to a father who should have been a priest. Joseph Dawson was born in the slums of Dublin in September 1888 - at the very time when Jack the Ripper's reign of terror among prostitutes was at its height in the gas-lit cobble lanes of neighbouring London. The mewling infant that came into the world in the sordid surrounds of "Monto", the inner-city Dublin demi-monde whose trade in myriad predilections was later to provide the backdrop for the Nighttown chapter in James Joyce's Ulysses, could not have known the circumstances of his birth. Those details are indeed obscure - and deliberately so. The birth was never registered. The mother was a widow. The father was a widower who had once simply "jumped the wall" in family folklore to escape an o'er-hasty decision to enter as a candidate for the Roman Catholic priesthood. If Patrick Dawson, Joseph's father, was ever married to Catherine Madden, there is nothing now to say so. This union - a union that begat Joseph - was itself never registered. There is nothing to show the parents were married at the time of birth, not in the records of Catholic inner-city parishes where tenements bursting at the seams provided an endless succession of tiny heads to be wetted at the font, nor in the ledgers of the State which, since 1864, had been dutifully recording every marriage and each new citizen of Her Imperial Britannic Majesty, Victoria, by the grace of God, Queen of Great Britain and Ireland. The failure to comply with the dictates of colonial masters is hardly surprising - up to five per cent of recalcitrants avoided official registration in those days - but the dispensation with Church sacrament for the wailing whelp is indeed extraordinary. It suggests an impediment, as indeed may have existed in the marital stakes. Perhaps Patrick Dawson had burned his bridges. As a "spoiled priest," his choices in personal relationships were strictly limited in a society deferential to its clergy. And Patrick Dawson's family was steeped in the faith. It provided a living for many of them in uncertain times. And it had done so for the extended Dawson clan since the days of the late 14th century, when proud kinsmen had been stripped of their lands around Tullow, Co Carlow. This vengeful scattering of the once-wealthy forebears followed the assassination of Richard Mortimer, Earl of March, heir to the English throne, ambushed and slain by the leading MacDaithi at nearby Kellistown, on July 10, 1398. MacDaithi, in the Irish language, means "David's son", pronounced MacDawhee - and the native phonetics would later engender a simple Anglicisation to Dawson. From a place as patriarchs, the Dawsons were reduced to the status of beggars, mere tenants on their former pastures. Thus the Church would become a refuge. It provided a living. One Dawson established an entire convent, and a tradition of Holy Orders grew through the centuries. In 1854, the father of the man fated to die on the Titanic was born in Tullow. Patrick Dawson was one of four sons born to slater Thomas Dawson and his wife Mary. All four of these sons would enter the seminary. Only Patrick blotted the family escutcheon by "jumping the wall." Patrick's three brothers - who became Fr Thomas, Fr William and Fr Bernard - were versed in Latin and Greek and moved up in the church. Patrick, the sole escapee, reverted to his earlier training as a carpenter. He moved to Dublin. He married a widow when he was 24. The spoiled priest was lucky that any woman would have him. Maryanne Walsh, a maker of corsets, from Fishamble Street, where Handel had given the first-ever performance of his celebrated "Messiah", agreed to be his wife. After all, she already had a daughter, Bessie, to care for, and could not afford to be proud. Patrick Dawson and the Widow Walsh were married in St Michan's Church, North Anne Street, in the heart of Dublin's markets area, on June 23, 1878. They lived at Dominick Place in the city. The Widow Walsh bore him two sons, Timothy and John, bound to become a slater and tea porter respectively. Timothy, who would later serve in the Boer War with the Dublin Fusiliers, arrived first, in 1879, and baby John two years later. Tragedy would strike with the third child. The Widow Walsh developed complications in delivery at the couple's cramped rented rooms in Copper Alley. She was rushed to the Coombe lying-in hospital where her child was born stillborn as its mother lapsed into coma. She died six days later, on February 22, 1883. She was only thirty. Patrick was down on his luck when he fell in with Catherine Madden - another widow, again with a child of her own to rear. Soon they were living together in a room in Summerhill, close to the yard where Patrick worked. They moved again and again, ever downward it appeared. Joseph Dawson, the focus of this article, arrived in 1888, followed by a sister, Margaret, four years later. This time the birth was registered, the parents formally identified. By 1901, all the other childen save Joseph and Margaret were sufficiently grown up to have moved away or into the homes of other relatives. 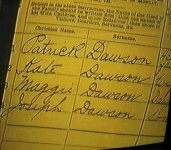 It is in the Irish Census of the turn of the century that we find Joseph Dawson listed for the first time - and the record, in the Irish National Archives, is the only piece of contemporary paper to list his full name. Patrick Dawson, described as a joiner, aged 44, is found living at a tenement in Rutland Street, north Dublin. Catherine, a year older and listed as Kate, is described as his wife although no certificate was ever issued. Here are the children - Maggie Dawson, aged 8, and Joseph, 12. It is April 1901. In eleven years, Joseph Dawson will be the 23-year-old trimmer from Dublin who signs aboard the RMS Titanic. For now however, the family must live in just two small rooms, one of nine families compressed into the four-storey tenement. And they are among the lucky ones - other families of eight and nine members make do with a single room. Determination drove them on through a widespread squalor, now thankfully consigned to the past. Joseph received an education, learned his father's trade of carpentry, was taught lessons by Jesuits who brought a crusading zeal into the community from nearby Belvedere College - later home of Fr Francis Browne SJ of Titanic photography fame - and grew to manhood. An event in March 1909 catapulted him towards his fatal encounter with the White Star Line. Catherine, mother to Joseph and his sister Margaret, succumbed to breast cancer. Her distraught husband Patrick, now 55, turned to his wider family for solace, just as relatives rallied round to provide opportunities for Joseph and Margaret in the wider scheme of things. Fr Tom, Joseph's uncle, offered to provide them with accommodation and a start in a new life. He was now based in Birkenhead, near Liverpool, England. Joseph Dawson and his sister took the boat for Britain, as so many Irish emigrants before them. Margaret went into service, and Joseph took the King's shilling, enlisting in the British Army as his half-brother Timothy had done only a decade before. Joseph chose the Royal Army Medical Corps and liked it. He took up boxing in the regiment, and was duly posted to Netley, one of the largest military hospitals in England. The magnet of Titanic now draws him closer. Netley is but three miles from Southampton. Joseph Dawson in the uniform of the Royal Army Medical Corps, 1911. From "The Irish Aboard Titanic." Joseph chose to leave within a few years. He had heard about the great Transatlantic liners that promised good pay for those unafraid of hard work. A temporary certificate of discharge was issued at Netley on June 30th, 1911, and survives in the family to this day. It reads: "Certified, that number 1854, J. Dawson, is on furlough pending discharge from 1st July 1911 to 20th July 1911, and that his character on discharge will be very good." There was another reason for leaving. On previous leave, which inevitably led to the bars and bright lights of Southampton, Dawson had made the acquaintance of a ship's fireman, John Priest. More importantly, he also came to know Priest's attractive sister, Nellie. The Irishman and the seaside girl began courting. 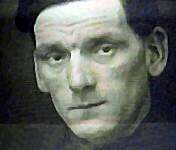 Titanic fireman John Priest, who survived. to take a job with the black gang. It was John Priest who poured into Dawson's ears the tales of the sea as they sat in pubs like the Grapes or the Belvedere Arms. And when discharge came, Dawson moved in as a lodger with Priest's mother at 17 Briton Street. Briton Street. the man inking the crew lists for the stokehold of the Titanic would hear the address incorrectly, writing it down as number 70, instead of seventeen. Perhaps Joseph's Irish accent was to blame; another Irish crew member, Jack Foley, had cried out that he was from Youghal, Co Cork. They put him down as coming from York. John Priest was fated to survive the disaster. The Southampton Pictorial would report in 1912 that Mrs Priest had "one son restored to her, but her daughters Nellie and Emmie both lost sweethearts." Poor Joseph Dawson, thinking of his Nellie as he struggled up from a liner's innards to a star-pricked sky that night in April. Had it really come to this? But a few months journeying with the Majestic, a glimpse of home again when the Titanic called to Queenstown, and now to face a lonely death in freezing wastes. He began taking off his shoes. buttoned the dungaree pocket in which he'd placed his Union card, and bit down hard on his lip. There was a belief in the family that Joseph Dawson might have married Nellie Priest. The newspaper report and a search of Southampton marital records for 1911-12 are all against it. Perhaps they had simply pledged their love forever. Further to our previous letter, we have to inform you that a N.S. & F. Union book, No. 35638, was found on the body of J. Dawson. This has been passed into the Board of Trade Office, Southampton, to whom you had better apply for the same. Yours faithfully, for White Star Line -"
... and a squiggle. The union card was all she ever had. No-one claimed the body of Joseph Dawson, and it appears the relatives might not even have been told that it had been buried on land. But branches of the family in both Britain and Ireland hold on to their memories - and Seamus Dawson, the oldest male relative and a nephew of Joseph, now lives by the crashing surf at Skerries, Co Dublin, looking over the waves to Lambay Island, where the first White Star Line maiden voyage disaster came with the loss of the Tayleur in 1854, the very year of his grandfather's birth. Patrick Dawson, spoiled priest, died penniless at the age of 77 in 1931. True to family form, he passed away in the care of the church, under the ministrations of the Little Sisters of the Poor. His son Joseph - carpenter, boxer, lover, trimmer, Irishman - lies half a world away, sleeping in a green slope in Nova Scotia, his grave now more popular than even that of the Unknown Child. It is a must-see site for the passengers of cruise liners that placed Halifax on their itinerary after the success of the highest grossing motion picture of all time. Jack Dawson never did exist. But Joseph Dawson, taken for all in all, was a man of flesh and blood, ripped from the veil of life at a tragically early age. So were they all, all flesh and blood. And their stories deserve to live, those of all the humble headstones serried nearby, tales untouched by a brush with recent fame. Join the A real Jack Dawson on Titanic discussion on our message board, 12 posts, last post by Josh Kusiak.